Meant to dramatically reduce the amount of sewage and polluted water that pours into the ship canal during storms, the project is a major driver of rate increases for Seattle Public Utilities customers that the City Council approved in November. As Seattle and King County prepare to break ground on an enormous tunnel along the Lake Washington Ship Canal for sewage and stormwater, the expected price tag for the project has increased from earlier estimates to $570 million. Meant to dramatically reduce the amount of sewage and polluted water that pours into the ship canal during storms, the project is a major driver of the rate increases the City Council approved in November for Seattle Public Utilities (SPU) customers. The initial cost estimate for the 2.7-mile tunnel between Ballard and Wallingford — made in 2014 — was $423 million, within a range of $339 million to $550 million. Since then, the project’s design has been altered and construction costs in the region have escalated, SPU officials said in a presentation Tuesday. Last year, SPU changed its estimate to $540 million — still within the initial range — and now the number is $570 million, the officials told a council committee. Seattle’s construction market is “one of the hottest in the world,” SPU project executive Keith Ward said, briefing Councilmembers Lisa Herbold’s utilities committee. The higher estimate for the sewage tunnel comes as Mayor Jenny Durkan’s administration grapples with cost overruns on a First Avenue streetcar line and on a series of transportation projects funded by the city’s Move Seattle property-tax levy. But SPU doesn’t expect the new $30 million increase in the tunnel’s projected cost to drive customer rates even higher — because the agency has saved money in the bond market and secured a low-interest state loan for the project, officials said Tuesday. Herbold, who chairs the council’s utilities committee, said she appreciated SPU presenting its latest estimate before sending key construction contracts out to bid. In 2016, the council didn’t learn about certain cost overruns on a new SPU and Seattle City Light billing system until the work was well under way, she said. The city and county teamed up on the tunnel after signing consentdecrees with the U.S. Environmental Protection Agency, U.S. Department of Justice and Washington State Department of Ecology requiring the jurisdictions to address water pollution. Sewage from bathrooms and stormwater from street gutters in older neighborhoods, like those along the ship canal, drain through the same pipes. During dry weather, the pipes carry the mixture to a treatment plant. But heavy rain can overwhelm those pipes, and when that happens, some of the dirty mixture spills out into the ship canal. Seattle and King County both maintain outfall pipes along the canal, and the consent decrees require them to reduce the problem to one spill per outfall pipe per year. By diverting a massive amount of sewage-stormwater overflow, the tunnel is expected to reduce pollution into the canal, Salmon Bay and Lake Union from 130 spills and 90 million gallons per year to six spills and 8.5 million gallons, Ward said. 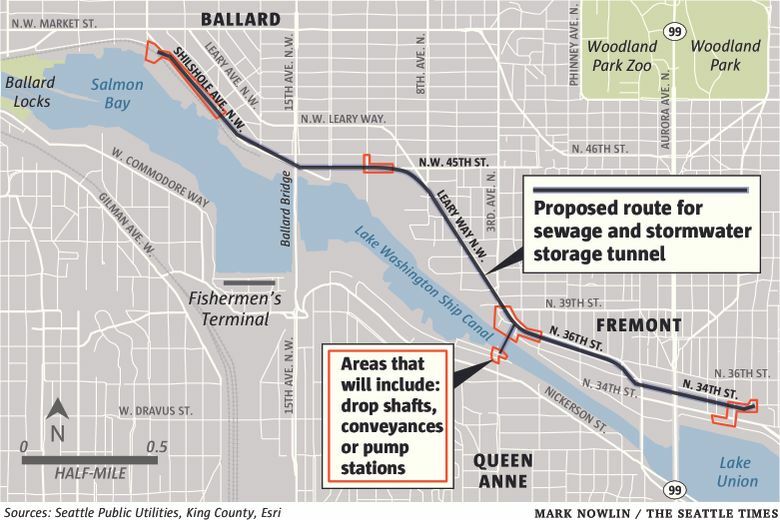 In addition to the main tunnel, which will have a diameter of nearly 20 feet, the project will involve the construction of huge drop shafts — up to 80 feet in diameter and up to 80 feet deep — in Ballard, Fremont, Queen Anne and Wallingford. The project also will include a smaller tunnel under the ship canal from Fremont to Queen Anne and a pump station in Ballard, officials said Tuesday. Preliminary work is planned for this year, with construction on the large tunnel scheduled to begin next year. The entire project is supposed to be done by 2026. SPU and the county signed a project agreement in 2016 that says their shared costs would be split 65 percent-35 percent, with SPU paying the larger portion. Later that year, Mami Hara took over as SPU director and ordered a pause on the project. Last June, Ward warned council members about that estimate being uncertain, he said Tuesday. SPU had decided to make the tunnel wider, based on new rainfall data and concerns about climate change leading to more severe rainstorms, he said. Work by independent experts, completed in September, helped the agency revise the project’s price tag to $540 million, Ward said. That number was used to inform SPU’s new six-year plan, which calls for annual average rate hikes of 5.2 percent. Before the council approved the plan, officials pointed to the tunnel project as a rate-increase driver and a watchdog group expressed concern. Starting in October and ending in January, another team of independent experts carried out a cost-reconciliation process, resulting in the new estimate of $570 million within a range of $533 million to $598 million, Ward said. SPU expects to pay $393 million of that, with the county covering the rest, he said. The price tag would be even higher without SPU making some money-saving adjustments, such as scrapping plans for ground-level odor control at certain sites. Why exactly has the estimate increased so much over four years? Making the tunnel wider added about $25 million and other design ”refinements” added about $47 million, according to Tuesday’s presentation. Escalating construction costs added $39 million and “planning and estimating corrections” added $19 million. SPU’s final design plans for the tunnel will need to win council approval before construction can begin.